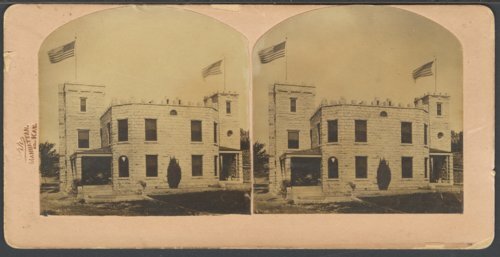 This is a stereograph showing Judge Samuel Kimble's stone home located 2001 West Poyntz Avenue in Manhattan, Kansas. It was built between 1894-1904 and was called Kimble Castle. Samuel Kimble was a Riley County District Judge.